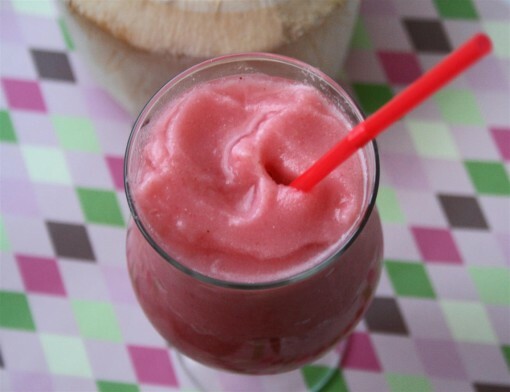 How to Cut a Young Coconut (& smoothie) was posted on January 27th, 2012 and is filed under Breakfast, Dairy Free, Drinks & Smoothies, Gluten Free, Healthy Living, Recipes, Vegan. This entry has 9 comments. You can follow any responses through the RSS 2.0 Comment Feed. I remember the first time I tried to cut a young coconut. I had a dull knife (and couldn’t find a sharp one), but I was determined to crack that nut! Turns out, it was hard, but after butchering and chopping away at it…it finally worked.Rule number one. Use a knife that works. The butter knife isn’t a good option. 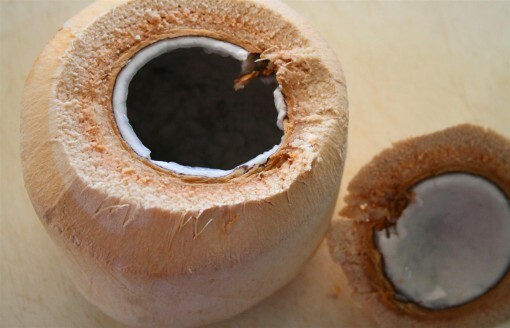 Cut a triangle shaped notch on the top of the coconut. You might need to “stab” it a couple times. And please, please be careful! Now drain the coconut, upside down, into a jar or glass to empty the water out. Save it! It’s incredibly good for you! It is LOADED with electrolytes…and is the absolute best for liquid hydration during exercise! Turn the coconut on it’s side. Stab it again (again, please be careful!) and then slice the whole top of the coconut off. You did it! Now scoop out the insides with a spoon (the meat is quite soft) and enjoy as is or in a recipe! 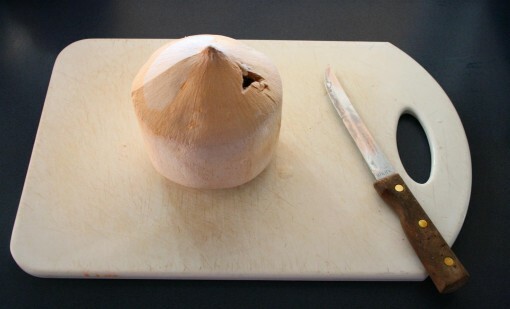 Note: There are other ways to cut young coconuts…but I’ve found that this is the easiest way for me! As you can see, I enjoy eating it right out the coconut. I think it’s a refreshing tropical treat. As you can also see, this is me when I was really blonde. Now, if you’re not the type who likes eating it straight…you might want to try this smoothie! I love it because it takes like a Tropical Strawberry Sorbet. I guess since all smoothies need names, I’ll call it that. Whiz up in your blender and then pretend you’re on the white beaches of Hawaii. Well, we all can dream, right? Right now I’m in a hotel in the states. We’re taking a loooong trip to see a dear friend get married! It’s nice to get away from the studying for a few days and just chill! Besides, I do so love a good love story. Especially when it happens to a special friend! Have you ever tried a young coconut? What are you doing this weekend? Thanks for the how-to, it makes me want to go out and buy some coconuts to try this for myself. I’ve been hearing a lot about the health benefits of coconut for hydration during exercise – and your smoothie looks fabulous! Your hair is so pretty in that pic. When did you go that light? Gorgeous! Julie~ How fun! I’d love to drink a young coconut fresh from the trees! Small hatchet or cleaver. Whack top 4 times on each side, cap comes off like your picture. Way better then “butchering and chopping”. Search youtube, there is one video showing 4 simple whacks and bam, the top comes off.